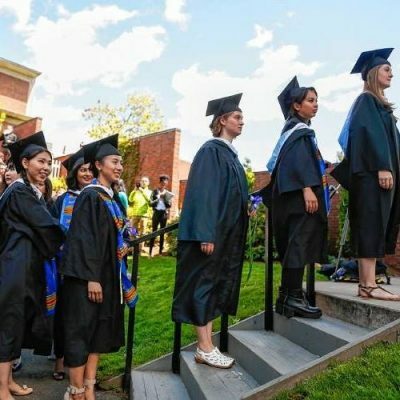 Instead of a program located in one department, Mount Holyoke provides a dynamic, collaborative initiative focused on ensuring that the august institution is meeting the particular needs of first gen students. According to Latrina Denson, associate dean of students for community and inclusion at the college, the collaborative, the First Gen Network, is comprised of administrators, faculty and staff who come together to ensure that first gens can successfully navigate the various components of college life that could pose challenges. They connect regularly with the college’s First Gen Low-Income Partnership, or FLIP, a student organization for first generation and low-income students that helps students find community within an institution that is traditionally affluent and built on legacy. And within this collaborative effort, enhanced by regularly attending the Class Action First Generation College Student Summit, the Mt. Holyoke brings an even sharper focus to first gen issues. Members of the First Gen Network include staff and administrators from the Dean of Students Office to staff overseeing student orientation to faculty members who are first gens or low-income themselves. Additionally, there are representatives from Financial Services, the Admissions Office, Career Development and Community-Based Learning. They come together to think about ways to not only support first gen students but to engage them in intentional ways. For example, working closely with FLIP, a mixer was held at the beginning of the year that brought first gens together with faculty and staff with similar backgrounds. The event gave students the opportunity to meet and support each other – and meet faculty and administrators who had used the strengths gained from their backgrounds to achieve success. Another initiative that came out of this collaboration focused on family support: a panel was convened specifically for parents of first gens at orientation. The college also put a special first gen spin on a Mt. Holyoke tradition: Cookies and Conversation. It was empowering for students to go to different departments and informally connect with staff, faculty and administrators and to be able to raise first gen issues. Associate Dean Denson adds that the first gen collaborative looks for different entry points for first gen students to be able to connect with various parts of the college, learn about resources available to support them, and have a platform for raising questions or issues of concern. She adds that in addition to listening to students to learn about their wants and needs, the college looks at trends and best practices to see what institutions are doing across the country to best serve first gens. Certainly, the First Gen College Student Summit provides a forum for learning about new innovations. As the host of this year’s (2018) First Gen College Student Summit, Mt. Holyoke will share its work with the 30+ other colleges and universities in attendance. As a first gen leader, it will be able to pass on the best practices it has developed while adding to its best practices from the hundreds of students, faculty, staff and administrators who will attend.